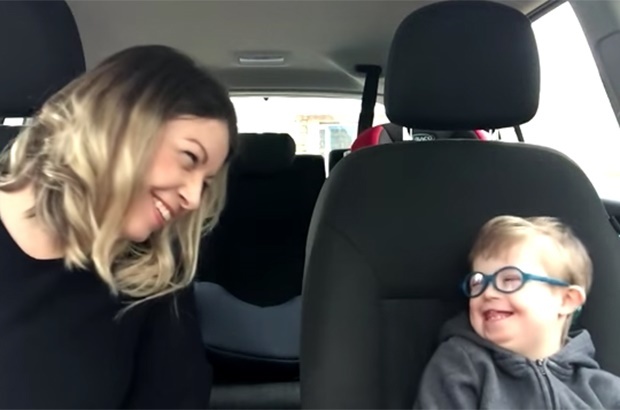 This video went viral for all the right reasons and just in time for World Down Syndrome Day. Today, 21 March 2018, is World Down Syndrome Day. It is a day reserved for celebrating the love and light that those with the syndrome bring to our world, and to raise awareness and understanding. Also read: "Down syndrome is the best thing that ever happened to me..."
Becky Carless, mom to gorgeous Archie, a 4-year-old with Down syndrome, came across a video by Signing Hands and came up with the idea of rallying her Facebook friends from the Designer Genes group and their kids to make this heartwarming video. The video features 50 mothers with their 50 children who have Down syndrome, singing along to Christina Perri's A Thousand Years and using Makaton – the form of sign language used by Signing Hands. The song opens, "Heart beats fast, colours and promises. How to brave? How can I love when I'm afraid to fall? But watching you stand alone all of my doubt suddenly goes away somehow." And as the chorus breaks, the signing moms are joined by their little ones, who are giving them the tightest cuddles, singing along or watching mom's hands move so they can sign along too. With the final chorus, "I have loved you for a thousand years, I'll love you for a thousand more," the sentiment behind both the video and song comes on the screen, even moving James Corden, the carpool karaoke king himself, to tears. Also read: Down Syndrome Awareness Day: how far we've come! As the video opens, so it concludes, stating that these moms and their little ones are not separated but connected by one tiny, extra chromosome. And life is just as ordinary and, sometimes, a whole lot of fun with the condition. One thing's for sure, they "wouldn't change a thing". Do you have a child or family member with Down syndrome? And how will you be spending World Down Syndrome Day? Tell us your story and send through your comments to chatback@parent24.com and we may publish them.